From the glories of its architecture to the value of its vintages, Reims is one of northern France’s most charming (and decadent) cities. 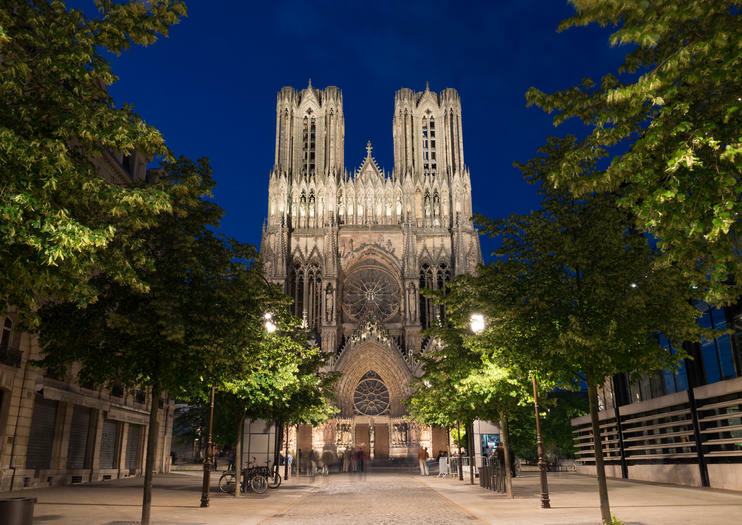 Three days is enough time to visit the extraordinary Reims Cathedral, tour exclusive Champagne houses, and even take a day trip into the French countryside. Here’s your perfect itinerary. The city’s unarguable highlight is Reims Cathedral (formally known as the Cathédrale Notre-Dame de Reims), a UNESCO World Heritage Site. Built in 1275 and standing 264 feet (81 meters) high, it was damaged during both World Wars but has since been restored to its original glory. Dedicate several hours to soaking up its Gothic splendor. After a break for lunch, glimpse other top landmarks (including the ancient Roman arch Porte de Mars) on a Segway tour of the city. Later in the day, exploring Tau Palace (Palais du Tau) or St. Remi Basilica (Basilique Saint-Remi)—both architectural marvels—before winding down with a cozy bistro dinner. In Reims, Champagne isn’t reserved for special occasions—it’s the stuff of everyday life. The petite city is considered the de facto capital of the wine region and is ringed by some of the world’s most exclusive Champagne houses (including Mumm, Veuve Clicquot, Pommery, and Taittinger). Spend your second day touring the cellars of one of Reims’ most popular houses, or venture to neighboring Épernay to explore its UNESCO-listed Champagne Avenue (lined by houses such as Moët et Chandon). Most full-day tours include indulgent lunches and round-trip transport, so you can sit back, relax, and sip in style. Upon your return to Reims, head to a neighborhood restaurant or enjoy a casual meal of ham, mustard, and Chaource cheese, all local specialties. Devote your third day to a trip intoa the scenic French countryside. History buffs can embark on a World War I–themed tour of the nearby Forest of Argonne, where battle sites, trenches, and other landmarks still remain. Alternatively, for those with a taste for opulence, the Château de Condé is famed for its sumptuous, Renaissance stylings. Dating back to the 16th century, the estate was frequented by royalty and members of the French nobility over the centuries. For a day trip of a different stripe, the family-friendly Nigloland—an amusement park with dozens of rides and shows—is also within commuting distance of Reims. Whichever excursion you choose, head back to Reims in time for dinner at one of the city’s Michelin-starred, fine-dining haunts. Champagne tasting at Moët & Chandon and Taittinger is a not-to-be-missed experience for connoisseurs of vintage French bubbly. This small-group tour of the Champagne-producing region of Reims, France includes a stroll down the Avenue de Champagne in Épernay and a visit to the tomb of Dom Pérignon in Hautvillers. Reims is the Champagne capital of France and there’s no better place to sample the world’s finest Champagne. This full-day tour includes a tour of the Veuve Clicquot Champagne estate, a visit to the UNESCO-listed Cathedral of Reims, a Champagne lunch, and Champagne tasting in the Montagne de Reims’ vineyards. Go behind the scenes of the Champagne industry on this full-day guided tour of Epernay from Reims. Sample Champagnes throughout the day, including a visit to the prestigious Moët & Chandon cellars. Drive through the Avenue of Champagne and admire UNESCO-listed vineyards, and visit a restored 19th-century Champagne house for a regional family-style lunch. On this small-group tour, limited to eight people, you’ll learn to taste Champagne like an expert. Spend a delightful day exploring France's most famous winemaking region on this afternoon Champagne tour from Reims. Travel with a guide and small group along Epernay’s celebrated ‘Avenue du Champagne,’ and learn what sets the region’s bubbly apart from other sparkling wines during a stroll through the vineyards and a tasting class at a restored Champagne house. Get a behind-the-scenes peak with a tour of a boutique family winery and, of course, taste plenty of the effervescent elixir throughout the day. Raise a toast to some of France’s most iconic Champagne Houses on this full-day tasting tour from Reims, France. Follow the ‘Scenic Route of Champagne’, stopping to stroll the famous Avenue de Champagne in Epernay; discover the legacy of Dom Perignon in Hautvillers and enjoy a guided tour of the Grande Maison de Moët & Chandon. Your Champagne–fuelled tour also includes Champagne tasting at a family-run winery and a glamorous Champagne tasting lunch, where you can sample varieties like ‘rosé’, ‘blancs de blancs’ and ‘blancs de noir’. Explore ancient battlefield sites and hear stories from the front line on this 2.5-hour First World War tour in northern France. Head into the Argonne Forest, site of fierce fighting between German and Allied forces during WWI. Discover campsites, trenches and tunnels used by the soldiers. Listen as your guide reads diary entries from French and German fighters serving on the front line, and hear tales of their hardships. See hidden communication posts, field hospital sites and canon bunkers, all interconnected during the war of 1914-1918. Make the most of your visit to Reims with a pre-booked Reims City Pass, which gives you free admission to museums and unlimited tram and bus rides. Choose between 1, 2, and 3-day passes, with an option to suit every timeframe. Torn between which museum to visit? Cover them all. You’ll also get free guided and digital city tours, as well as discounts on restaurants, shops, car rentals, and Champagne cellar tours. Enjoy skip-the-line access to the Palais of Tau in Reims by pre-booking your tickets in advance. Explore inside the former Archbishop’s Palace on a self-guided tour, learn more about its regal history, and admire the exquisite collection of sculptures, tapestries, and historic costumes. Enter the exciting world of Nigloland amusement park. This family-friendly theme park has lots of variety to choose from, including four different worlds, eight theme restaurants, and 39 rides, meaning there’s something for everyone.